﻿ Takaishi Industry | We making innovative products to change this world for the better. We are Takaishi Industry, making innovative products to change this world for the better. Takaishi Industry's rubber O-ring for hydrogen is adopted by many hydrogen stations in Japan with its high quality. These photographs of the hydrogen station were taken with the cooperation of Osaka Gas Co., Ltd.
We sought to expand what we can do with rubber. An inquiry from Professor Nishimura (HYDROGENIUS: Hydrogen Material Advanced Science Research Center in Kyushu University) came to us about making rubber test pieces for hydrogen exposure. We decided to accept the challenge to make them, with a "let's try to do it" attitude. We happened to meet with Hitachi Automotive Systems Measurement (hydrogen dispenser manufacturer) and started our challenge to develop O-rings for breakaway devices. We completed the O-rings for a -40℃ specification. The beginning of the collaboration with Professor Shin Nishimura was a phone call he made, where he requested us to "Please make two kinds of test pieces, NBR containing carbon black and NBR not containing carbon black". In fact, he had called more than 10 companies until he met us, but the 10 phone calls were all declined. 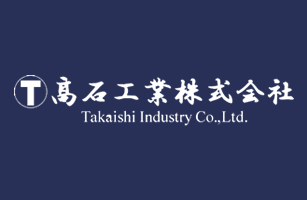 The first company that listened to his inquiry was Takaishi Industry. Although his inquiry was something "beyond common sense in rubber manufacturers", we immediately willing accepted, by saying "let's try". Takaishi Industry's challenger spirit of "trying" led to the successful development of rubber materials for hydrogen resistance. We are now a provider of various test pieces in their model compound of more than 50 kinds, and are helping their high molecular hydrogen research. We met Hitachi Automotive Systems Measurement at the International Hydrogen Energy Development Forum 2010 through Professor Nishimura (Kyushu University). At the forum, we talked about that we were trying to develop the O-rings for breakaway devaices, and they started to help us. However, there was a series of problems at the first step. And many trials turned out hydrogen leaks, even though we improved O-rings with completely new developed rubber material each time. Eventually, in 2013, we finally completed the O-rings which could be used in hydrogen environment of -40℃. It is an achievement that was accomplished due to our cooperative relationship. Takaishi industry will keep challenging to the new fields. When the research and development project of hydrogen resistant rubber materials had started in 2008, it was just the same time that our company was going to evolve from the subcontract-based rubber manufacturer to the developmental. I remember that I felt it was somehow fate for Professor Nishimura's request, so I accepted it with an immediate reply. Though I said yes, hydrogen resistant rubber materials were, even for our company which had over 60 years of history as a specialized manufacturer of industrial precision rubber seals, had no precedents and totally unexpected conditions of use. It is not an exaggeration to say that it was a series of trials and tribulations, to finally make into a product as the rubber O-rings for hydrogen stations. However, bringing our experiences and know-hows together for this first time challenge, we were able to succeed. The motivation of the development team was, in addition to the feeling that we wanted to meet customers' expectations, I think, it was a sense of responsibility and pride that we had been entrusted with an important mission that may have held the key to popularization of hydrogen stations. Rubber seals to seal all the fluid such as water, air, gas would not be seen and would have a unmarked presence, but it is important to the existence to support the lifestyles and industries. To broaden the possibilities of rubber means to widen the potential of any technologies. We, Takaishi Industry will, as well as meet the society's needs and the customers' problems with reliable technology, keep challenging to the new fields. When we started delivering rubber test pieces to Kyushu University in 2008, we were still not sure what kind of world the "hydrogen society" was. After that, we were given the opportunity to be involved in the development of O-rings for breakaway devaices and now our O-rings are actually used at the hydrogen stations. This development was accomplished solely with the support from people around us. We made a new material and experimented, with a leak every single time, and sometimes we thought this seal might be unattainable. However, even then, we tried again with the encouragement of our customers, the university lecturers and the staff of the experiment facilities. We hoped we could contribute to the development of the "hydrogen society" with thanks to all the people who supported us. In the development of hydrogen resistance rubber materials, the most difficult thing was the determination of the optimum formulation of the rubber compound. It is required to resist "high pressure hydrogen (90MPa)" and "low temperature (-40℃)" for the breakaway devaices in the hydrogen stations. We tried more than 60 formulations using the experimental design method. In those experiments, leakages occurred repeatedly; sometimes we could not bear the results. Still, with support of the people around us, we reworked the compound design many times, and finally we succeeded in making O-rings that could withstand practical use. Since hydrogen stations are going to expand in the future, we would like to strive to improve the quality, aiming to create even more reliable products. We can create original products from commencement to realization. Our Compounding technology has been developed in the 70 years history since our foundation. We conducted high pressure hydrogen tests at Research Center for Hydrogen Energy and have a large amount of trial case data for our O-rings. In collaboration with HYDROGENIUS (Hydrogen Material Advanced Science Research Center) in Kyushu University, we are researching the influences of high pressure hydrogen on rubber materials. What is new at Takaishi Industry. Please contact us for not just hydrogen rubber seals but also the development of special rubber seals and research into rubber materials. © 2016 Takaishi Industry Co., Ltd.